Before we became parents, my wife and I had idealistic notions of archiving and cataloguing each of children’s creations. Every daycare art project, Sunday School scribble and cardboard-tube sculpture would be preserved for posterity. After all, how cold-hearted would a person have to be to callously discard the product of those adorable little hands? These notions, or course, were the product of industrial-grade ignorance concerning the sheer volume or work that could be generated in the first five years of life. 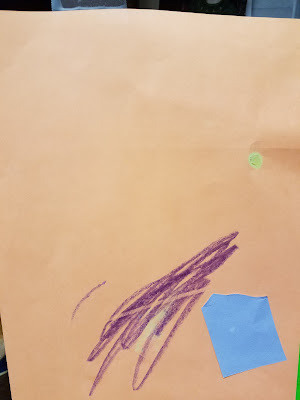 A child’s portfolio becomes unwieldly after a few weeks of daycare. Letter-of-the-day paintings, scissor practice, gluing projects and handwriting exercises litter our cars and home. This excludes special “seasonal” projects (the last three months of the calendar year are an avalanche of artistic output) and birthday items. When did you first become aware of the fragility of the human condition? The night I walked to into the kitchen and found my father treating the artistic manifestation of my soul as a buffer between his hand and the remaining refuse he was forcing down into the Hefty bag. Eventually, we implemented an informal hierarchy based upon whether or not our child handed us the item or editorialized on its significance. If the handoff was silent and perfunctory, we would place it in the special stack and then my wife and I would silently will the other to throw the stack away. If they presented the item and said “I make fwroggie! !” it would be displayed. This stemmed the tide slightly, but as they have grown and become more invested in their work even this approach was unmanageable. This stage has collided with the upcoming birth of our third child which has re-appropriated the junk room we used to keep the ballooning stack of creations. Said stack now resides on the desk in our bedroom and remains largely unacknowledged by my wife or I. This game of sentimental chicken cannot continue to grow unabated lest it spill into the floor and common areas. This would ultimately lead to an intervention by child protective services to save our children from the danger posed by their own artwork collections that their parents were emotionally-incapable of discarding. We also wish to be cognizant of the amount we keep for each child. Since the art mediums vary, I am not sure if we should strive to keep the exact amount from each child or subject all archived items to the “jumbo buffet takeout” test and quantify by weight. I do know that whenever I visited my father’s office as a child, my homemade desk organizer was always prominently displayed. It was a ghastly combination of popsicle-sticks, hot-glue and diffidence. I imagine that if he ever ate lunch at his desk he had to remove it from view to stem the nausea. I would always comment on it when I was there and he would smile and mention something about how it “livened up his office” as if the entire atmosphere of his building had been positively affected by its presence.